A trend I’ve been seeing is iOS interfaces getting bulkier and when you’re going for portability, size is the enemy. 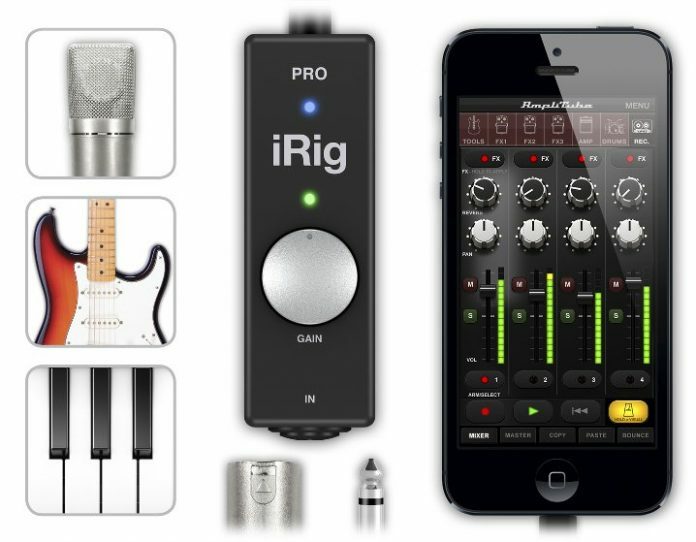 The guys over at IK Multimedia understand this and have released the iRig Pro, a one stop shop for all things recording. You get a 1/4″ XLR combo along with a MIDI connection. Not only that but they offer compatibility for all types of Mac devices. You can pretty much plug in any type of mic, midi device or 1/4″ instrument and start making music just about anywhere that will tolerate your Zydeco Metal Dubstep! IK Multimedia, the global leader in mobile music-creation apps and accessories, is proud to announce iRig® PRO, the universal digital mobile audio/MIDI interface for iPhone, iPad, iPod touch and Mac. Pocket-sized, battery-powered and fully portable, iRig PRO is designed to give mobile musicians and songwriters an interface that can handle the widest variety of audio input signals, so they can create music and audio on the go anywhere, any time.